A few weeks ago I was on a long drive home and I got stuck on the freeway in traffic, in the middle of the Nevada desert. I was in a bit of a hurry as I was trying to make it home for the funeral of a friend's father. So I decided to get off the freeway to find a way around it. Google Maps assured me that there was another road available. I found the road, and even though it was a dirt road I still decided to chance it. This story is not about my poor decision at that point in time but rather about the many people who came to help me when I got stuck in the sand about a mile down that road. After doing everything possible to get myself out, I finally decided to walk back out to the main road to flag someone down. The first (and only) car to stop was a white minivan. 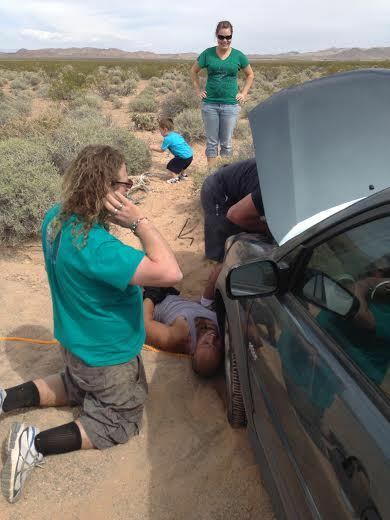 Knowing that they would not being able to pull me out, I explained the situation to three people in the van. They insisted on coming to my rescue anyway. I got in their van and they drove a short way down the road then walked the rest of the way back to my car, which was seriously buried up to its axle in the sand. These three did everything they could to help me move my car but after about 30 minutes we had made little progress. Miraculously, a 4X4 jeep ended up driving up (they were also looking for a shortcut around the traffic) and they were able to help pull me out. Not just once, but twice because I got stuck again when I tried to turn around. They continued on their way once I was pointing in the direction of the main road. The minivan friends had started walking back towards their car. I was terrified that I was going to get stuck again on my way out, but the jeep friends (mom, dad and child) had assured me if I just gunned it I would be fine getting out. So I did. And less than half way back to the main road, I got stuck again in another sandy area of the road. My minivan friends had stuck around to make sure I got out, so they came back when they saw I was once again stuck. As you can imagine, at this point I was extremely frustrated and very grateful to have their support. Incredibly, not even five minutes after I got stuck again, a large white truck rambled onto the scene. Another couple got out leaving their two kids in the truck. They were also looking for a way around the traffic and were happy to pull me out one more time. They made sure I was back on solid ground before they left me behind with the minivan friends, who were still there making sure I got out okay. Words really don't do justice to the gratitude I feel towards all these good Samaritans, especially the minivan friends. They truly went above and beyond what even the nicest of people would do for a stranger. I was completely helpless and they saved me. Thank you and I hope to be able to do the same for another one day.